The original version of this article, by David Biello, appeared in the University of Minnesota’s Momentum Magazine. The view from space offers a clarity about our changing planet less visible from the ground: spring thaw coming sooner year after year, the iconic snows of Kilimanjaro and glaciers across the globe dwindling – and a great green wall of vegetation spreading across the region just south of Africa’s Sahara Desert. 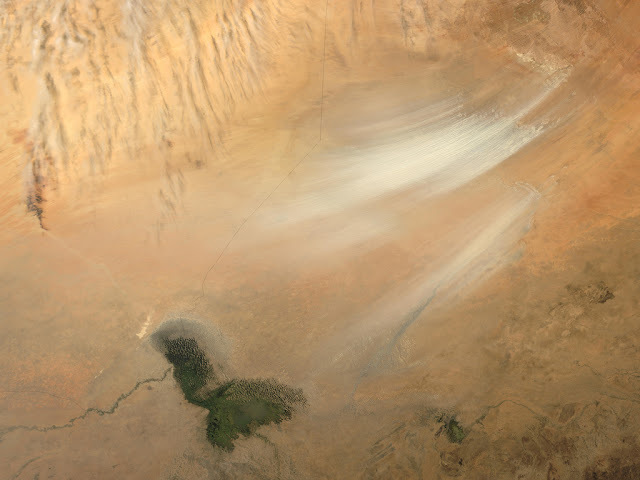 This arid expanse, known as the Sahel, stretches from the Atlantic Ocean to the Red Sea. It has undergone a remarkable transformation since farmers in nations across the region began to allow trees to grow amidst their crops. In some places it was by accident, as seeds sprouted from manure spread as fertilizer in Niger. In others it was by design, such as the “green dam” against the desert started in Algeria in 1971. But the result has been the same: improved harvests of millet, sorghum, and other staple crops in a region gripped by perennial drought. Such “agroforestry” boosts yields by returning vital nutrients to the soil in the form of decaying leaves, shading crops from the harshest sun, and recharging underground water reserves. The trees also provide an additional source of income: wood for fires and construction. And they have another even more important benefit: They may help some of the poorest farmers in the world adapt to climate change – while potentially removing as much as 50 billion metric tons of carbon dioxide from the atmosphere, according to agronomist Dennis Garrity, head of the Nairobi-based World Agroforestry Centre. Climate change is already worse than anticipated by the UN Intergovernmental Panel on Climate Change. Extreme precipitation events, such as last spring’s flooding in Nashville, Tenn., or last winter’s drought in China, have become more frequent. Sea ice extents have reached record lows in the Arctic. And 2010 marked the end of the hottest decade in recorded history. Not only that, but the 0.7-degree-Celsius uptick in global average temperatures we’ve seen so far is only half the warming that can be expected from the concentrations of greenhouse gases already in the atmosphere, according to a 2010 report from the U.S. National Research Council. And as warming continues, according to the NRC report, the world can expect (among other things) a drop in the yield of cereal crops due to higher temperatures, an increase in heavy rainfall, and a rise in ocean levels. In other words, whatever measures might be adopted to reduce emissions of greenhouse gases, the world will still need to adapt to a changing climate. Indeed, that process has already begun. Continue reading on the University of Minnesota’s Momentum Magazine site. Photo Credit: Deep in the Sahel, the dwindling Lake Chad borders Niger, Chad, and Nigeria. Courtesy of flickr user NASA Goddard Photo and Video.